Did Adam and Eve Glow? Very Possibly! Adam and Eve were sinless before they ate from the forbidden tree. In their sinless state, they were full of all the energy — the life energy — that God gave them. But did they glow in the dark? Did they radiate the glory of God through their sinless flesh? This may seem like a silly question to you, but hang with me for a minute. 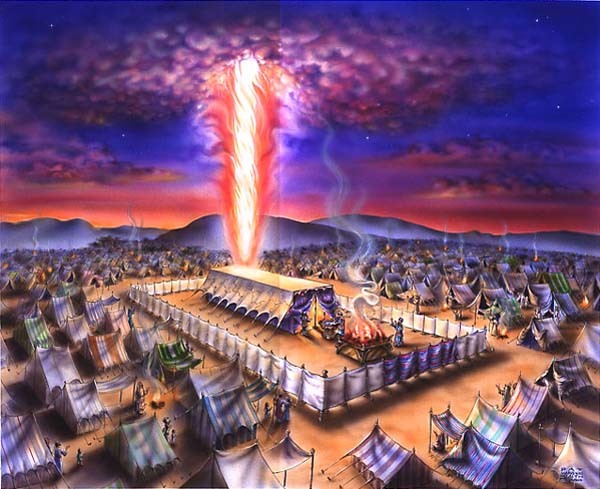 Do you remember reading about the Shekinah Glory in the Old Testament? God made his presence known in dramatic ways, and showing His glory radiate was one of those ways. What is the Shekinah Glory? Schechinah (Hebrew: שכינה‎), is the English transliteration of a Hebrew noun meaning dwelling or settling, and denotes the dwelling or settling of the Divine Presence of God. The word for Tabernacle, mishkan, is a derivative of the same root and is used in the sense of dwelling-place in the Bible, e.g. Psalm 132:5 (“Before I find a place for God, mishkanot (dwelling-places) for the Strong One of Israel.”)[not in citation given] and Numbers 24:5 (“Your dwelling places, Israel,” where the word for “your dwelling places”, transliterated, is mishkenotecha). [not in citation given] Accordingly, in classic Jewish thought, the Shekinah refers to a dwelling or settling in a special sense, a dwelling or settling of Divine Presence, to the effect that, while in proximity to the Shekinah, the connection to God is more readily perceivable (source: Wikipedia). 1 Samuel 10:5–6 After that thou shalt come to the hill of God, where is the garrison of the Philistines; and it shall come to pass, when thou art come thither to the city, that thou shalt meet a band of prophets coming down from the high place with a psaltery, and a timbrel, and a pipe, and a harp, before them; and they will be prophesying. And the spirit of the LORD will come mightily upon thee, and thou shalt prophesy with them, and shalt be turned into another man. Now think about Moses when he went up the mountain to commune with God. Exodus 24:15–17 And Moses went up into the mount, and the cloud covered the mount. And the glory of Jehovah abode upon mount Sinai, and the cloud covered it six days: and the seventh day he called unto Moses out of the midst of the cloud. And the appearance of the glory of Jehovah was like devouring fire on the top of the mount in the eyes of the children of Israel. Moses received the 10 commandments while up in that mountain and I can only imagine what he must have felt to be in God’s presence. Look what happened when he came down from the mountain. Exodus 34:38 And the children of Israel saw the face of Moses, that the skin of Moses’ face shone: and Moses put the veil upon his face again, until he went in to speak with him. Being in the presence of God caused Moses’ face to shine so brightly the people couldn’t look at him until he put a veil upon his face. Now think about the veil in the temple that separated the Holy of Holies from the people. Only the high priest, once a year, could enter through that veil and offer sacrifice for the people. The lesson is that God is unapproachable by those who live in darkness. Mankind’s fall removed man from God’s presence and man cannot even look upon Him let alone come near to him because of His holiness and our unholiness. Jesus Christ’s sacrifice changed all that. When he died the veil in the temple was torn from the bottom all the way through the top by the hand of God. Man could now enter through the veil into the very presence of God because of Jesus’ sacrifice. Man can once again enter God’s Glory. God is so luminous that fallen man cannot look upon him. Moses glowed so brightly after being in the presence of God that people could not even look at him. God’s glory radiated with light when He showed Himself to Israel. I believe, before the fall of man, that Adam and Eve also glowed with the glory of God through their mortal flesh, just like Moses. When they sinned, the glory was removed and, “they knew they were naked.” That radiant barrier probably provided heat as clothing does, and when it was removed they felt naked and went to cover themselves. They could obviously see they were physically naked before; nothing changed there. Perhaps they just became aware of it them, which is the common thought, but there is the possibility that God’s glory was removed and they shone no more. They could see they were naked, i.e. without the glory of God encompassing them. Now before you walk away and think I’m crazy, what about Jesus Christ? He was transfigured on the mountain before his crucifixion to show him and his principal disciples the end result — Christ glorified. Matthew 17:1-3 And after six days Jesus took with him Peter and James, and John his brother, and led them up a high mountain by themselves. 2 And he was transfigured before them, and his face shone like the sun, and his clothes became white as light. 3 And behold, there appeared to them Moses and Elijah, talking with him. Now hang on just a minute here. Jesus’ face shone like the sun and his clothes turned white as light! That’s some powerful bleach! Doesn’t this sound a bit like the experience Moses had when the people couldn’t look at him after he came down from the mountain, radiating the glory of God? Adam and Eve were sinless before they ate from the tree of the knowledge of good and evil. They walked with God daily. They were in His presence daily. I believe their faces must have also shone like the sun though they had no clothes to bleach white! The lesson in all this is that God’s so pure, so holy that flesh cannot even look at Him or approach Him. It is only through Jesus Christ’s sacrifice, once for all, that mankind has been invited back into the presence of the Almighty God, creator of the heavens and the earth. When Jesus returns and Christians receive our glorified bodies, those bodies will be just like Jesus Christ’s is now. Who shall change our humble body, that it may be fashioned like unto his glorious body, according to the working by which he is able even to subdue all things unto himself. That, my friend, is the promise of all promises! Can you imagine being like Jesus was on the mount of transfiguration? Can you imagine glowing with the glory of God radiating from your face and your clothes? Can you imagine the level of energy you’ll have after you’ve been raised from the dead — or changed at his coming if you are still alive — and you’ve received your very own glorified body like Jesus Christ has now? These are not pipe dreams people, they are the promises of God. He’s given us His Word so we can find these things out. How would you like to radiate the glory of God in your life? You may not physically glow, but that’s not out of the question. You definitely will glow throughout your being with God’s presence as you study His Word, believe it and act on it! Come on in and enjoy the fellowship with God and our Lord Jesus Christ, with others in the body of Christ. the light would become visible to the eye and be seen as a red glow. Hebrew אדם (‘adam) meaning “to be red”. Excellent input! Thanks. Yes, I glow a little red myself!